Discussion in 'Android News' started by Preach2k, Sep 1, 2011. 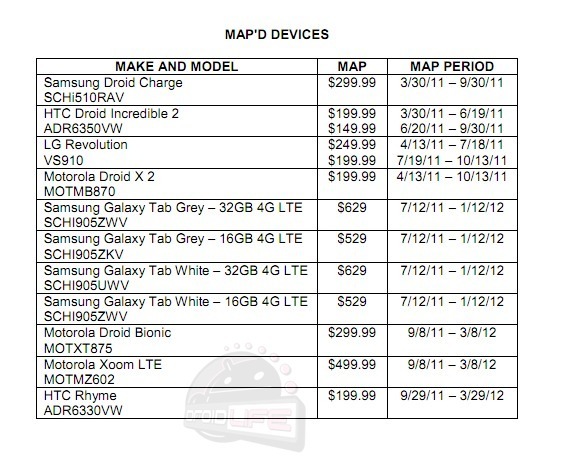 A new Verizon MAP list has been leaked. The first thing to notice is the HTC Rhyme which was leaked in early August as the ADR6330. There has been nothing else leaked about this device other than the fact that the model number fits somewhere between the HTC Merge (ADR6325) and DROID Incredible 2 (ADR6350). It is probably a mid-range Android device that could end up being global. I also notice that there is no mention of the Nexus Prime or the HTC Vigor unless the Ryme is the Vigor... which I doubt. I guess we have to wait and see how this map pans out!! !